DUE TO SOME SCHEDULING CONFLICTS, WE ARE RESCHEDULING OUR APRIL LUNCH FOR FRIDAY, 4/23. DETAILS BELOW. --although neither has been added to in a while. Maybe that's appropriate for a place that bills itself as "el mejor secreto de Chicago" (the best-kept secret in Chicago). Let's go and discover the secret for ourselves! Last edited by tarte tatin on April 8th, 2010, 10:27 am, edited 4 times in total. This is great! I've been meaning to try TBA for quite while! nr706 wrote: This is great! I've been meaning to try TBA for quite while! Oh, all right ... I'll show up anyway. But only for the company and because I love the food at ToP. I will do my best to be there. I've wanted to try this place for a long time and being there with other LTHers will provide a perfect opportunity to sample a bunch of their offerings. I'm looking forward to joining you all. Me and my membership card will be there. ronnie_suburban wrote: I've wanted to try this place for a long time and being there with other LTHers will provide a perfect opportunity to sample a bunch of their offerings. My thoughts exactly! Hope you can make it, Ronnie! Dave148 wrote: Me and my membership card will be there. Please scratch me from the list. I am so sorry to cancel, but I was just invited to a staff luncheon for a retiring colleague at the same time, and I need to be there. 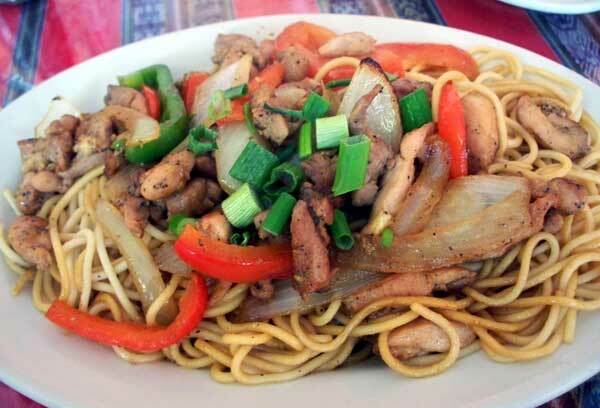 I am sure the food will be better at Taste of Peru, and I'll miss your company. Looking forward to hearing what you think. BUMP! Just a reminder about the ELG lunch scheduled for this Friday.... The more, the merrier! Please note: The date for the April ELG lunch at Taste of Peru has been changed to Friday, 4/23. Great! We had a scheduling conflict as well tomorrow, but would love to join you on the 23rd. As a matter of fact, we have tickets that very evening to hear the great Afro-Peruvian singer Susana Baca at the Old Town School of Folk Music, so this is arch-appropriate. The planets align! See you all then. Great! Looking forward to seeing you all on Friday! Last edited by tarte tatin on April 20th, 2010, 11:10 pm, edited 1 time in total. I would like to attend if there is still room. moetchandon wrote: I would like to attend if there is still room. Yes, certainly! I've added you to the list. See you Friday! Sadly, it looks like I'll have to bow out tomorrow. I have to leave my office early at the end of the day and because of that, I can't also take a long lunch. Very sorry to miss what I'm sure will be a good one. Sorry, need to take a pass today. I have to attend a funeral. I'm afraid we have to cancel at the last minute. What a shame! We were looking forward to this. So sorry you won't make it.... We'll miss you! Thanks to Gail for organizing this lunch. Even though it was a small group, it was a good one. I probably hadn't been to Taste of Peru in a couple of years - I'd forgotten how good it is. One of the first things I noticed - they seem to have gotten a new sign. 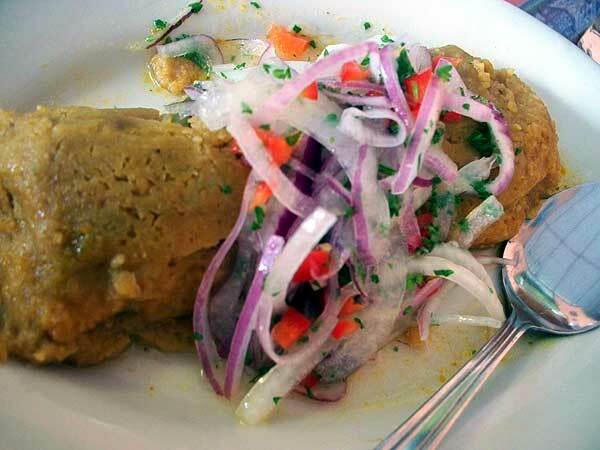 We started with a Peruvian Tamal, stuffed with chicken, and topped with marinated onion. 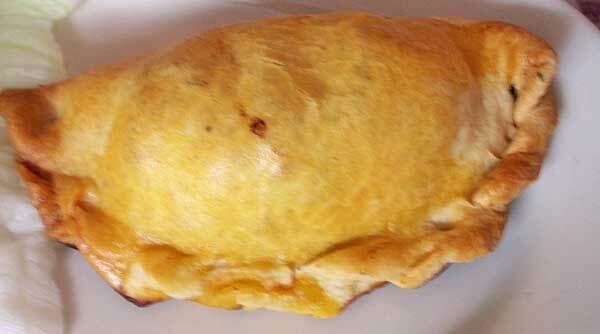 On to an Empanada de Carne (Beef with raisins, walnuts and egg). 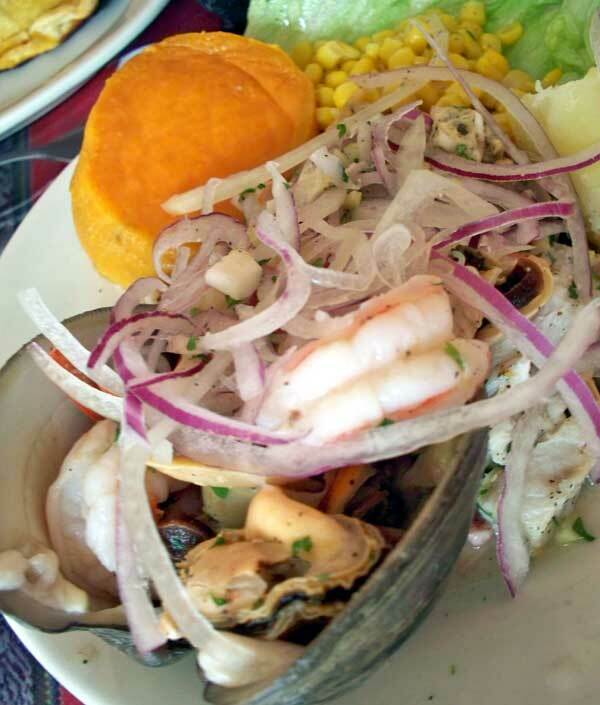 My favorite appetizer was the Ceviche Especial - lots of shellfish, with onions, corn and sweet potato. 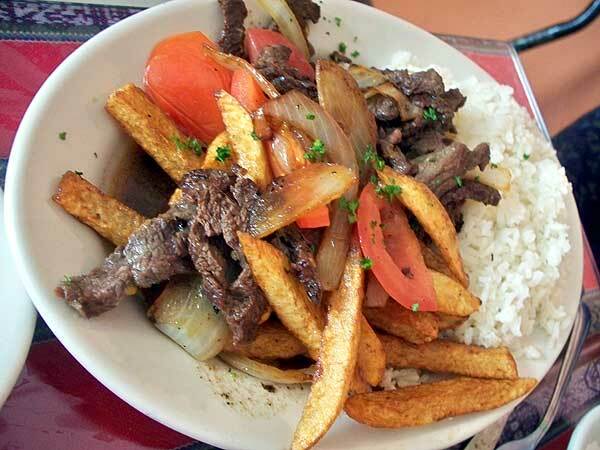 and the Lomo Saltado, beef with French Fries. 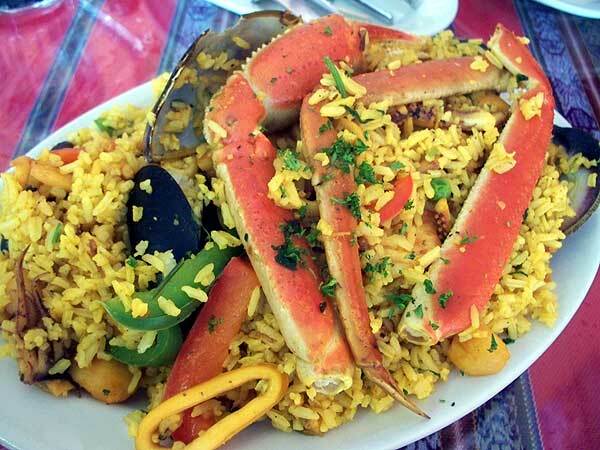 Taste of Peru also makes an excellent Paella, with a good variety of seafood. 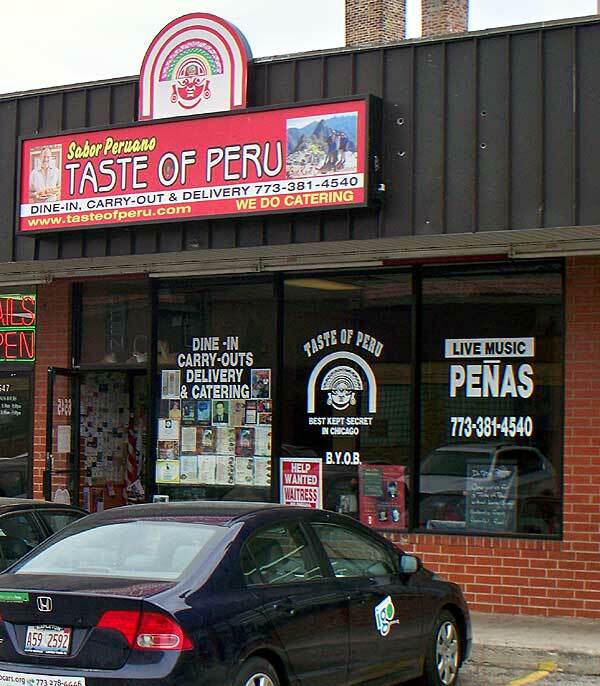 After Deta's, Taste of Peru is only the second restaurant the Evanston Lunch Group™ has visited more than once in its nearly five year history. Next month will be someplace new.